If you’ve never been involved in the market-place of organized religion you’ve missed something very unusual and at times extremely bizarre. You may also be very fortunate not to have been taken for a ride by many who run such religious groups. If you’ve been, or presently are, an active participator in a particular faith group that expects a high level of commitment from you, then please do read on; it might just save your sanity somewhere up ahead. I’ve been there and have the tee-shirt to prove it. 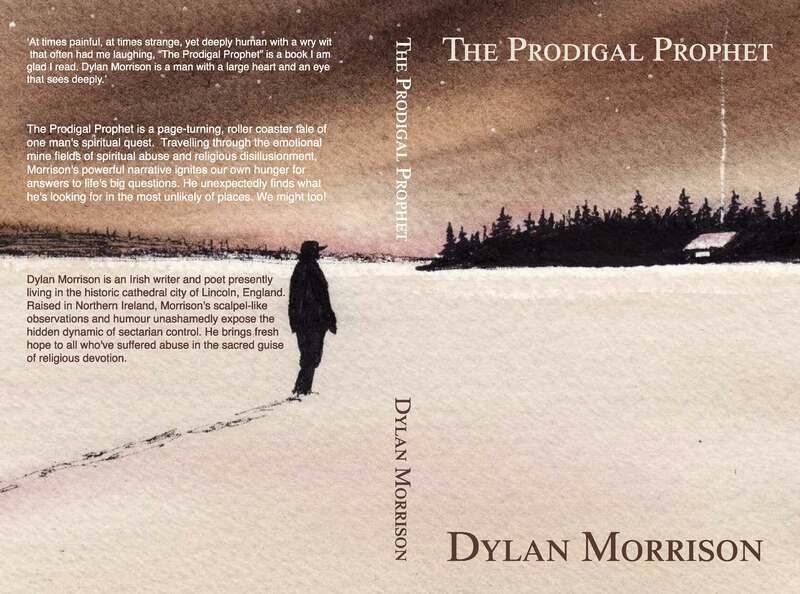 Read my roller-coaster story ‘The Prodigal Prophet’ to understand where I’m coming from. I’ve painfully discovered that following Yeshua and giving one’s life over to a zealous religious group may not be synonymous. The Wizard of Oz meets The Pilgrim’s Progress. Tired of religion? – then read on! A captivating autobiography of religious disillusionment, burnout and Divine Love. Bumping into the Divine during the’ Irish Troubles’ Dylan Morrison was blissfully unaware of the amazingly painful journey that lay ahead. Searching for a more radical approach to the God thing, he passed through various manifestations of the Charismatic world before becoming a ‘Prophet’ in an abusive international Shepherding group. The sudden death of his infant son, Ben, became the catalyst for Dylan’s painful disillusionment with religion, replacing it with a deep interest in psychology and self-help philosophies. Sixteen years later with the dust covered Bible in the attic and the ‘tongues’ long gone Dylan was reinvaded by Divine Love in two mystical encounters. Six months later suffering from nervous exhaustion Dylan was emotionally stripped bare. Healing slowly began with a revelation of the pain of psychological attachments and the sense of Presence at the bottom of the dark abyss. Dylan believes that the spirituality and mysticism of Yeshua, the Nazarene holds the answers for those tired of religious dogma and presentational overkill. An amazing story of hope for those wounded by abusive religion and life’s tragedies. Though organized religion can help provide a framework of support through fellowship and pastoral direction, helping enhance one’s faith, the power and influence it can over people’s lives can often be abused and misused. I think it’s important to have the freedom to ask questions, to seek, to listen to God within and hear how He is directing us individually. It’s dangerous to one’s faith when we become distracted so much by church activities that we have ceased to listen to the small voice within, whispering to us the secrets of the Kingdom, whispers that are unheard among the sometimes loud ramblings of the church. There has to be a balance, in my opinion. It’s sad, but I’ve found many of the protestant circles, which are very knowledgeable in regards to theology and doctrine, neglect the spirituality that gives life and light to our walks…the actual experience and not just knowledge of God, that allows us to enter into the amazing and infinite depths of his love. Thank you for your most encouraging and thought provoking comment. I agree with all you say but tend to see my support network as various individuals rather than a ‘faith group’ to which I belong. I find your writings both thought provoking and encouraging. You are diligently searching for a personal, close relationship with Jesus Christ (or Yeshua as you so tenderly describe him). He is as close as your breath and gave his life so that you might have life more abundantly. My journey has led me in and out of churches, but never away from my Heavenly Father’s presence… It is His unmerited Grace and Favor that makes me the “Righteousness of God in Jesus Christ”.. I can’t do anything to earn this wonderful Grace and the ultimate sacrifice of Jesus Christ in coming to Earth and giving His life for me will keep me for all Eternity in His Precious Presence. Thanks for the lovely and encouraging comment Patty. Yes my journey has taken me through many expressions of relationship with Yeshua. I now believe that He and the Divine Source are more mind blowing than traditional ‘Christian’ doctrine can describe, including that of penal substitution. Thankfully the gift of Holy Breath leads us all into further revelations of Yeshua, the incarnate Logos/Tao. I deeply appreciate your prayers and trust that my journey will give hope to many seekers who no longer stay in the prevailing Christian box. Blessings be upon you and yours!